​​​​On 17 May 1972 the 14th Armored Cavalry Regiment furled its colors and was reflagged as the 11th Armored Cavalry Regiment. The Regiment once again unfurled its colors in Germany. This time it was at the famous Fulda Gap. The Regiment assumed a new, two-fold mission; defending the Fulda Gap against a possible Warsaw Pact attack while also conducting day-to-day surveillance of 385 kilometers of the Iron Curtain dividing East and West Germany. The Regiment relieved the inactivated 14th Armored Cavalry Regiment and joined V Corps - "The Victory Corps." The Regimental mission in the General Defense Plan (GDP) was to strongly reinforce the United States Army Europe (USAEUR) as the covering force for V Corps. The importance of the Fulda Gap is that it offers to any attacker from the east the shortest and most direct route across the middle of West Germany. A successful thrust through the Fulda Gap, aimed at seizing the Rhine River crossings at Mainz and Koblenz, would sever West German and NATO forces defending it. As so often in the Regiment's history, it had to disperse its squadrons. Located at Downs Barracks in the City of Fulda were the Regimental Headquarters and First Squadron, known as "Ironhorse." Second Squadron, known as "Eaglehorse," was stationed at Daley Barracks in the spa City of Bad Kissingen. Third Squadron, known as "Workhorse," established its new home at McPheeters Barracks, Bad Hersfeld. Fourth Squadron, or "Thunderhorse," was in Fulda, at Sickels Army Airfield, where aviation elements were stationed. Fourth Squadron grew to become one of the largest aviation units in the Army with 74 helicopters. A comprehensive effort to upgrade/modernize the Regiment's various installations was begun by Crosbie Saint, (47th COLONEL OF THE REGIMENT). The "Quality of Life" program made living conditions more suitable for the Regiment. Modernization brought with it organizational change on a comparable scale. The Regiment grew in size, became more diverse in its capabilities and increased its self-sufficiency. The Regiment now numbered over 4,600 soldiers, a four-fold increase over the original 1901 troop count. In 1985 the newly formed Combat Support Squadron, known as "Packhorse," was activated in Fulda. Maintenance Troop was the largest in the Regiment with 366 troopers. Of special note was the 58th Combat Engineer Company, known as the "Red Devils," who won the Itschner Award, symbolic of the best Combat Engineer unit in the U.S. Army. In 1991 the 511th Military Intelligence Company, known as "Trojanhorse," was selected as the best company-sized intelligence unit in the Army. Border operations were serious business. Each cavalry troop of the Regiment could expect border duty four times a year - each tour lasting 21-30 days. Duty day began with a 0600 border briefing, a review of SOP's and an update on the latest sightings or incidents. Part of the mission was to demonstrate to potential adversaries that the Blackhorse, representing all NATO forces, was well-disciplined and ready to fight. The trooper’s gear had to be clean, boots highly polished, uniforms pressed, weapons spotless, and radios fully operational. After inspection, the troopers were divided into reaction forces; observation posts (OP’s), and patrol duty (PD's). Usually two armored vehicles with 10 men would respond virtually without notice to any contingency along the border. The crews had 10 minutes to be moving out of the camp gate - fully equipped, weapons mounted, ammunition on board. Patrolling was a 24 hours a day - 7 days a week function. Observation Posts (OP's) served as base camps as well as vantage points for observation. First Squadron occupied OP Alpha near Hunfeld-Schlitz-Lauterbach. Second Squadron was at Camp Lee northeast of Bad Kissingen near Bad Neustadt. Troops were dispatched to OP Tennessee. Third Squadron manned two OP's; Romeo, overlooking the Eisenach-Bad Hersfeld autobahn, at Herleshausen, which was a legal crossing, point. ​The W​arsaw Pact and the legitimacy of the Eastern Europe's Communist military regimes were disintegrating. 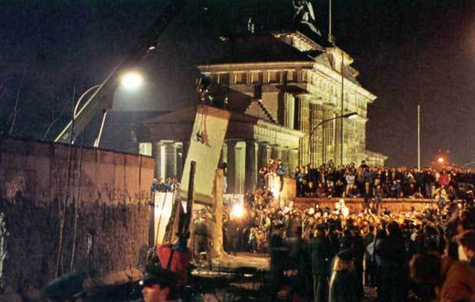 The stage was clearly set for a dramatic transformation of the European status quo that had existed since the Cold War began. One historic day changed the mission of the Regiment in Fulda irrevocably. On 1 March 1990 the Regiment ceased border operations altogether and closed its OP's. Less than eleven months after the border opened for the two Germanys to re-unite, the Blackhorse lost its claim of being a "Border Regiment." The Regiment's legacy was a justifiable pride at having played an important role in one of the greatest victories of military history, a victory all the more remarkable for having been won without firing a shot. 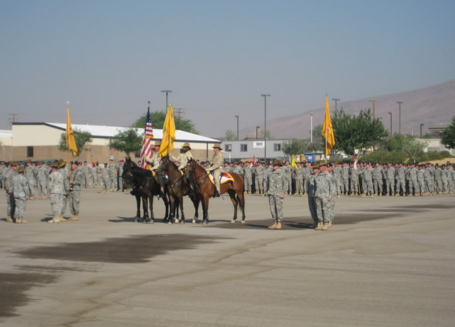 ​​Reactivated again on 26 October 1994, the 11th Armored Cavalry Regiment now serves as the Army's Opposing Force at the National Training Center. The regiment portrays a determined opposing force that trains US forces in the basic principles of army operations and challenges all the battlefield operating systems. As the 2nd Brigade Tactical Group, the squadron trains brigde and battalion task forces during ten rotations a year at the National Training Center. The Blackhorse Regiment was inactivated in a ceremony on 15 October 1993edit this text.